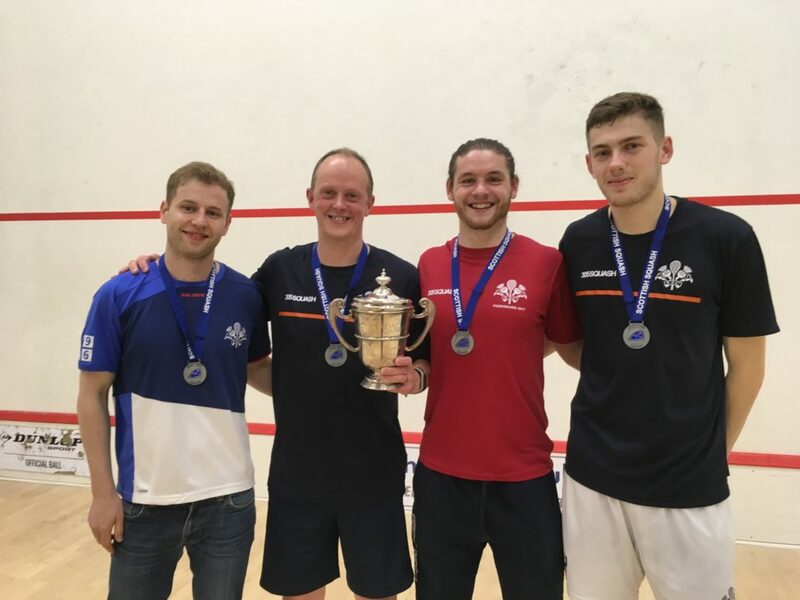 Edinburgh Sports Club (ESC) retained the Men’s National League title last night (Wednesday) on home turf, defeating The Grange Squash Club in the final. ESC took the tie 3-0 but were made to work hard by their local rivals in front of a healthy crowd who generated a great atmosphere. Ross McHoul (ESC) took on Brendan Forrester in the opening match and it didn’t disappoint. Forrester took the first game 6-11 before McHoul fought back to level up, winning 11-5 in the second. It was the Grange player who took a tight third 8-11 before McHoul won the next two 11-8, 11-8 in what was a tense and thrilling battle throughout. 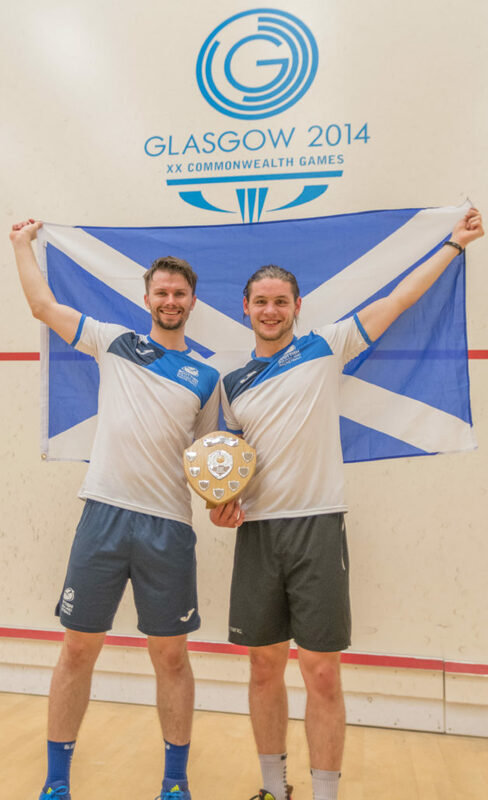 Match two between 2017 Scottish Doubles Champions Doug Kempsell (ESC) and Kevin Moran, below, was always going to be a tight, exciting encounter, although it was a surprise to everyone when Kempsell took advantage of a slow start by Moran to win the opener 11-0. Moran fought back impressively taking the second 4-11 before the pair traded the next two games with some brilliant exhibition squash, Kempsell claiming a long third 14-12 and Moran the fourth 6-11. Into the fifth they went and again it was edge of your seat stuff with Kempsell staving off a late Moran fightback to take the decider 11-8. ESC skipper Simon Boughton then sealed the win for his side winning in four against Mike Shean, 11-8, 11-6, 7-11, 11-5. 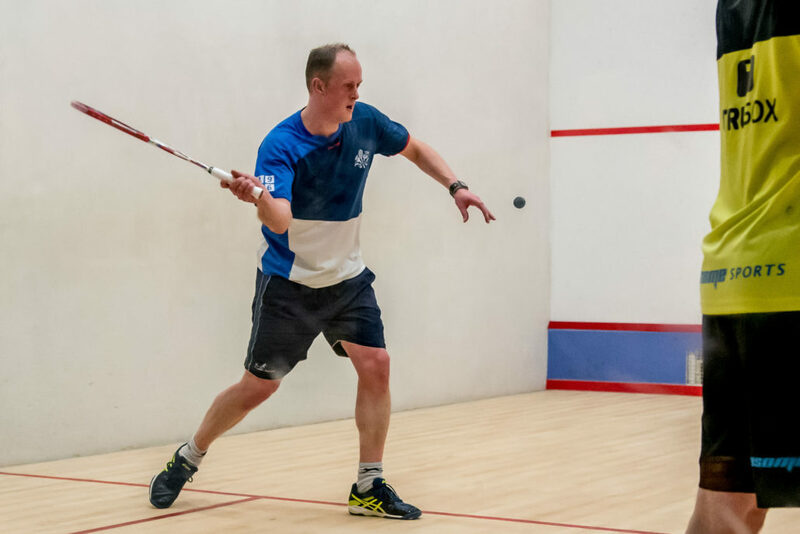 Shean produced some quality squash but Boughton’s experience and consistency saw him home. In the dead rubber, Rory Stewart defeated Ali Mutch 10-12, 11-2, 11-2. 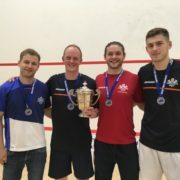 Delighted ESC player Doug Kempsell said: “There was some great squash in all the matches which was pleasing because we wanted to put on a decent show for the crowd. “I’m pleased for Ross because he’s had some tough matches with Brendan so to finally get through was a good boost. He continued: “Kevin and I always seem to have a good battle. It’s never 3-0 either way. “I was saying to Kevin after the match that winning the first game 11-0 actually put me off slightly. “I wasn’t expecting it and you kind of take your foot off the gas. He added: “I have played for Edinburgh Sports Club for about six years now and it’s like home now. The win for ESC means they join their women’s team on the flight to Eindhoven, Netherlands in September for the European Club Championships (Sept 19-22). “We had a great time last year in Paderborn (Germany) and it’s always a good trip,” Kempsell said. Simon Boughton added: “With the women having qualified, this was big for us and we are delighted to get through against a very good Grange team.